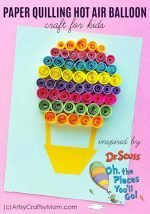 Bring alive the lovable elephant from Dr Seuss in this Horton Hears a Who Quilled Paper Craft! With a free template, this is perfect for Dr Seuss Day! I am among the people who’ve given up reading newspapers first thing in the morning. Honestly, I can’t think of a more depressing way to start your day! There’s so much news of people getting bullied and harassed that it’s easy to lose faith in humanity. But when you read a book like Horton Hears a Who, you know that all is not lost! It’s just amazing when you think that this popular Dr Seuss book was published in 1954, and its content is so relevant today. The Whos are tiny people whose voices can’t be heard, which makes it easy for them to be squashed. But noble Horton stands by them despite what others say. What is particularly endearing about this story is that even the bullies come around in the end and vow to protect the Whos. Now if only that happened in real life! 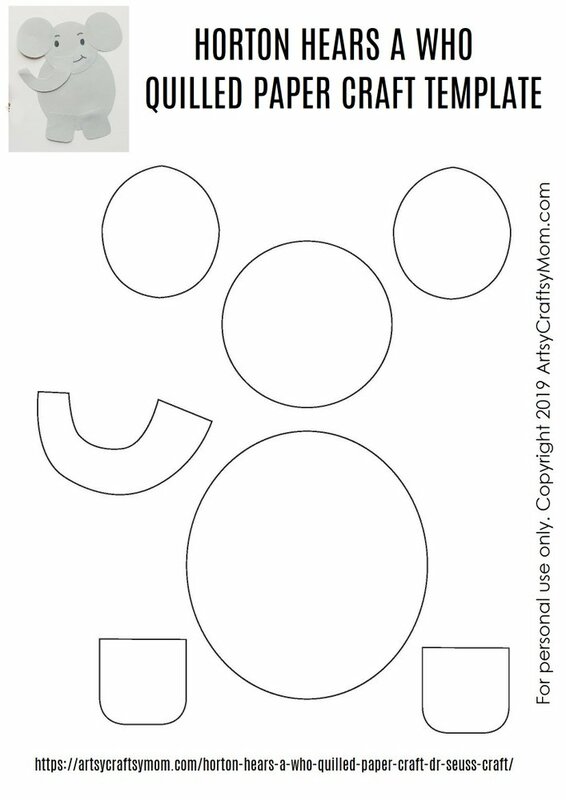 With Dr Seuss’ birthday coming up and considering the current state of world events, it’s the ideal time to celebrate characters like Horton – with a Horton Hears a Who Quilled Paper Craft. So let’s go ahead and remind the world that a person’s a person, no matter how small! 1. 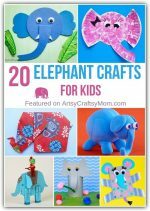 Select grey colored craft paper for the elephant (Horton) and trace the template patterns on it. Cut out the traced patterns using scissors. 2. Attach the head (medium circle) and the feet cut outs with the body cut out (big circle). Attach the ears and the trunk in their places to complete the elephant. 3. 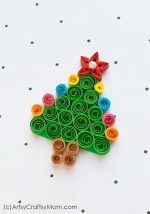 With the pink quilling strips, make quilled lens shapes, about 9-10 pieces. 4. Cut out a small circle from pink craft paper. This will be the base for the quilled flower. 5. One by one, glue the quilled lens shapes on the small round cut out until the flower is complete. 6. 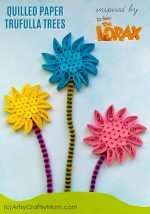 Attach a paper strip at the back of the quilled flower for the stem. Stick the stem of the quilled flower on the trunk of the elephant. Use black sharpie or maker pen to trace the eyes, and other details of the paper elephant. Your Horton is ready! And not just Horton, the clover with Whoville is also here. 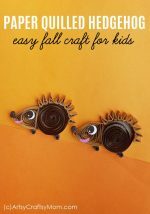 This is a good craft for siblings to bond over – the younger one can do the elephant, while the older one works on the flower. 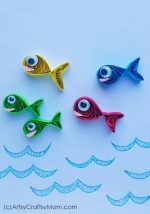 You can also use this opportunity to introduce the kids to other iconic Seuss characters like The Lorax or the fish from One Fish Two Fish Blue Fish Red Fish. Doesn’t matter how it turns out – after all, a craft’s a craft, no matter how messy! Where is the free template download?